This Olympics-focused editorial series is written by Ronald Urbach, Chairman of law firm Davis & Gilbert LLP and the co-chair of the Advertising, Marketing & Promotions Practice Group at the firm. The Olympics - I have been watching exciting events, fantastic competition and great stories. This week, I became the roving warrior, on the west coast in meetings. How was I going to stay connected to the Olympics? I became emotionally invested during Week One; I was not going to be happy merely reading the results online. The good news of course is that we now live in a world where being away from a television no longer means having to miss the show. Most of us already carry in our pockets and handbags our principal communication device, our smartphone. But fewer of us are aware that our phone may soon be our principal entertainment and viewing device as well. Already for these Olympics, having a smartphone (and a cable subscription) means having the ability to watch all 302 competitions of all 32 Olympic sports, both as they happen in real time, and in many instances, on demand, in available taped programs. So although I have been on the road these past few days, often far from a TV, I have still been watching all my favorite athletes compete, and in doing so, have also been watching the commercials that run during all NBC Olympic mobile programming. This means that in the past I would have represented a missed opportunity to advertisers by travelling; today they can still reach me. And I have been impressed by how well advertisers are adapting to mobile - there is real beauty and intensity to many of the spots. It is interesting to realize how captivated I am when watching the advertising on my mobile device. And - in a good bit of news for the industry - it seems I am not alone. At the beginning of the second week of Olympic programming, NBC reported that around 8 million users had signed up for its live video streaming service, and that there had been over 7 million downloads of the network's Olympic mobile apps. In close to two weeks, NBC has streamed close to 103 million videos over its digital platforms, and 45 million have been live video streams. To put this number in context, consider that there were only 75.5 million videos streamed for the entire Beijing games, and only 14 million streamed live. Halfway through the London Olympics, NBC had already streamed 8.7 million hours of live digital content, all of which contained advertising. The advancement of mobile networks and streaming capabilities is greater than ever and the wonder of mobile is becoming ever more obvious. A captive audience, intently focused on their devices, often with headphones securely in place so not a word is missed - it's an advertiser's dream. And yet, NBC's digital properties will run just over $60 million worth of advertising. Although that dwarfs the $20 million in digital ad sales for the 2008 games, it pales in comparison to the over $1 billion in total ad sales NBC made for these Olympics. Correspondingly, as happens during other major sporting events like the Super Bowl and NCAA championships, the frequency of mobile searches has risen during the Olympics. Google has reported an unusually large, tenfold increase in mobile searches during these Olympic games, which is also good for advertisers who have invested in keyword search and other paid search advertising. Even the experience on-site at the games is a microcosm for what's to come in mobile technology. 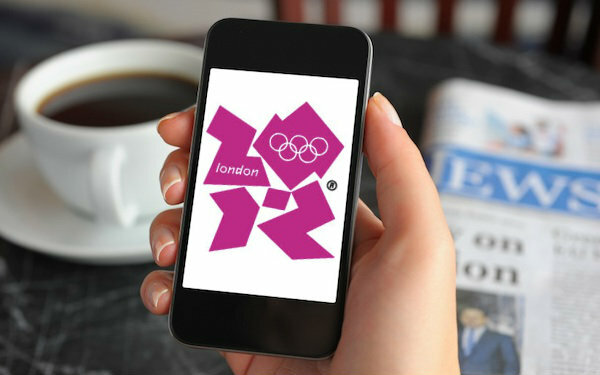 Visa, in partnership with Samsung's GALAXY S III mobile phone, has implemented mobile payment stations at over 3,000 Olympic retail locations and in over 5,000 taxis in London. Attendees of the Olympic events and Londoners alike can now very easily wave their phones to pay for food, beverages, souvenirs - and get through lines more quickly than ever before. And it is not just consumers who have been flocking to mobile. So too have the athletes participating in the games. I wonder whether London may be remembered as the first Twitter Olympics? And before you think that this is a bad thing because of complaints that Twitter often spoils the results of the competition - or because certain athletes have turned to Twitter to make less than intelligent statements - consider the positive, too. Social media chatter about the Olympics is at levels never seen before during any sporting event, and all that chatter is driving viewership. Consider the audience: according to some estimates, nearly 60% of viewers talking about the Olympics on Twitter are female, marking an unprecedented level of female engagement around a sporting event. Sometimes it is difficult to recognize when we are standing at a transformative moment in history. But for me, these Olympics have proven that the migration of consumers to online and mobile media is real and is now happening at an unbelievable speed. We're sure to see advertisers follow suit in the coming months through increased digital and mobile budgets during major events and in general. It's an amazing time to be in advertising! Ronald Urbach is the Chairman of law firm Davis and Gilbert LLP and the co-chair of the Advertising, Marketing and Promotions Practice Group at the firm. His clients include numerous multinational, national, and regional advertising agencies, including those agencies that are viewed as being the top creative agencies in the world. Ron can be reached at rurbach@dglaw.com.